The last trend summer is leaving us with slime green everything. We knew the '90s were back, but we didn't know they were back with the slime green color, too. Now, '90s nostalgia is real as slime green takes over the last bit of the season and brings us back to our Nickelodeon days. Neon green reached its legitimate trend status once it was seen on the runway this past February at the Prada Fall 2018 Milan show. The neon green fringe dress from the show was later worn by Sarah Paulson to the Ocean's 8 premiere in June, paired with a neon green belt and bag. Its presence at both the show and one of the summer's biggest movie premiere's solidified the color's elevated popularity. Soon after, more notable celebrities began wearing neon green. Internet star Kylie Jenner has worn the pop of color multiple times this summer. In June, Jenner sported a two-piece neon green Fendi look followed by neon green heels in August, and most recently, a neon green bikini. Blake Lively has also been seen in the bold shade of green at a press event for her new movie, A Simple Favor, where she wore a color-coordinated blazer, top, and trousers. Kim Kardashian has also been spotted in some neon green looks in the past few months, wearing green dresses, a wig, and taking the trend a step further: matching her cars in the neon hue. 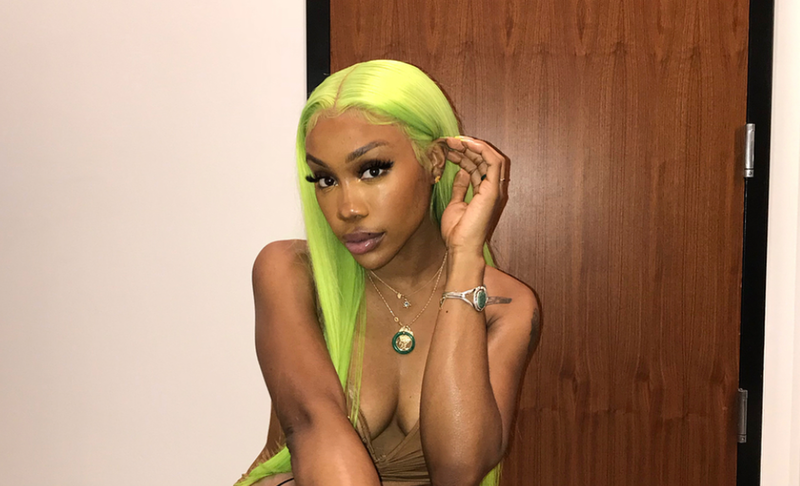 Lottie Tomlinson, one of Louis Tomlinson's sisters, has added slime green to her list of bold hair colors with her hair being the vibrant green on her trip to L.A. recently with Revolve, where she also wore neon green eyeshadow. Even Queen Elizabeth II has been seen wearing the color: in a coat and hat on her first event with the Duchess of Sussex solo. So now that we've seen the trend in action, the question remains... will neon green withstand the future of fashion? The fall season typically brings out darker, jewel tones such as emerald, burgundy, and plum. By the time next summer comes around, I have a feeling that we'll already be onto the next color trend. That being said, we'll have to keep an eye out at New York Fashion Week to truly see if neon green is here to stay!